Wheelie Campers opens up some of Australia’s finest landscapes to those who are mobility-challenged adventurers. The company claims to offer the first self-drive wheelchair accessible campervans in the country. Pickups of campervans can be done at their main branch in Biggera Waters in Gold Coast or can be delivered right at your doorstep nationwide. They may even drive you to your relatives or provide a driver―whatever that fits your needs. All of these are done by the company because they know that each rental is unique. Wheelie Campers supplies campervans that cater to up to 5 passengers, plus a driver and a wheelchair. These are 2 berths but can seat more for as long as the extra passengers are willing to sleep in a ground tent. Based on a manual transmission, these campervans are all converted to comfortably accommodate travellers who need assistance while exploring some picturesque views. The Mercedes long wheel based vehicles are highly maintained to comply with those wheelchair accessible vehicles. Furnished with 240v, the campervans allows you to charge the system through the engine, main inlet, and an external power source. All Wheelie Campers have a range of insurance options. The company has a mandatory third party insurance at AU$59 daily with a corresponding deposit/ excess of AU$5,000. With an additional of AU$129.00 reduces the deposit/ excess into AU$1000. And if you avail of the fully comprehensive insurance with no deposit, you need to pay AU$450 per day. Wheelie Campers holds are an attractive reputation to those who are mobility impaired. Their fleet of campervans has a wheelchair-based front passenger seat and easy lowering bed system for their convenience. 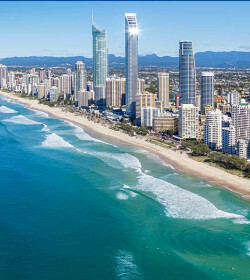 They have drop-off and pick up from major cities in the country, including Cairns, Melbourne, Adelaide, Brisbane, Gold Coast, Perth, Darwin, and more. Not only that, they may accommodate requests of special delivery of campervans. The custom dropoff location is such a nice feature for travellers with special needs. One thing to note if you're renting a unit from them is that your campervan may act as a moving endorsement―all models are splashed out with bright colors and company logo and designs, giving more stares while venturing the road. 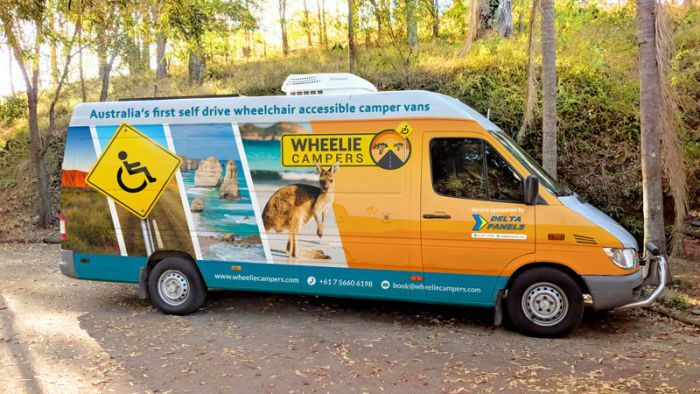 Wheelie Campers, from the name itself, is armed with a fleet of wheelchair accessible campervans that can be delivered right at your doorstep. As this is a new company we emailed and asked to be called back. The staff arranged for a airport pick up and drop off. We opted for a driver and so pleased we did. He went the extra mile and did intrude. Thanks Paul and the whole team at wheelie campers. We are planning our next trip in January.